Also serving communities of Gretna. There are 30 Assisted Living Facilities in the New Orleans area, with 9 in New Orleans and 21 nearby. The average cost of assisted living in New Orleans is $2,400 per month. This is lower than the national median of $3,346. Cheaper nearby regions include Kenner with an average starting cost of $2,250. To help you with your search, browse the 120 reviews below for assisted living facilities in New Orleans. On average, consumers rate assisted living in New Orleans 4.4 out of 5 stars. Better rated regions include Slidell with an average rating of 4.5 out of 5 stars. Caring.com has helped thousands of families find high-quality senior care. To speak with one of our Family Advisors about assisted living options and costs in New Orleans, call (855) 863-8283. New Orleans, Louisana, is home to the Mardi Gras celebrations each March, during which seniors and people of all ages can enjoy more than 70 parades. The city is home to more than 37,000 seniors, some of whom may not be able to complete daily tasks independently. There are nine assisted living facilities in New Orleans to support these seniors. In New Orleans and the rest of Louisana Assisted Living Facilities (ALFs) are also known as Residential Care Facilities (RCFs), both of which are regulated by The Department of Health and Hospitals, Health Standards Division. The cost of living in New Orleans is 107.5, slightly higher than the U.S. average of 100. Heathcare, however, is less expensive than the average at 88. Seniors may find that the lower healthcare costs help offset the higher cost of living in the area. Seniors in New Orleans will appreciate how tax-friendly Louisiana is for retirees. Social Security payments and public pension incomes aren't taxed at all, and private pension income and withdrawals from retirement accounts are only partially taxed. The New Orleans Regional Transit Authority (RTA) provides public bus services throughout the area. Seniors age 65 and older are eligible for reduced fare on both buses and streetcars. The air quality in New Orleans ranks 52 on a scale where 100 represents the areas with the best air quality, slightly lower than the national average of 58. Seniors with respiratory issues might want to consider one of smaller towns or cities in Louisiana. New Orleans has a violent crime rate of 49.1 and a property crime rate of 56.8, both considerably higher than the U.S. averages of 22.7 and 35.4, respectively. Family members may want to ask facility staff about protocols in place to keep residents safe. Temperatures in New Orleans are comfortable and range from 92 to 45 degrees. Sperling's Comfort Index gives the city a rank of 75 out of 100, much higher than the national average of 54, suggesting that the area might be ideal for seniors with joint pains or arthritis. Assisted Living costs in New Orleans start around $2,400 per month on average, while the nationwide average cost of assisted living is $4,000 per month, according to the latest figures from Genworth’s Cost of Care Survey. It’s important to note that assisted living rates in New Orleans and the surrounding suburbs can vary widely based on factors such as location, the level of care needed, apartment size and the types of amenities offered at each community. 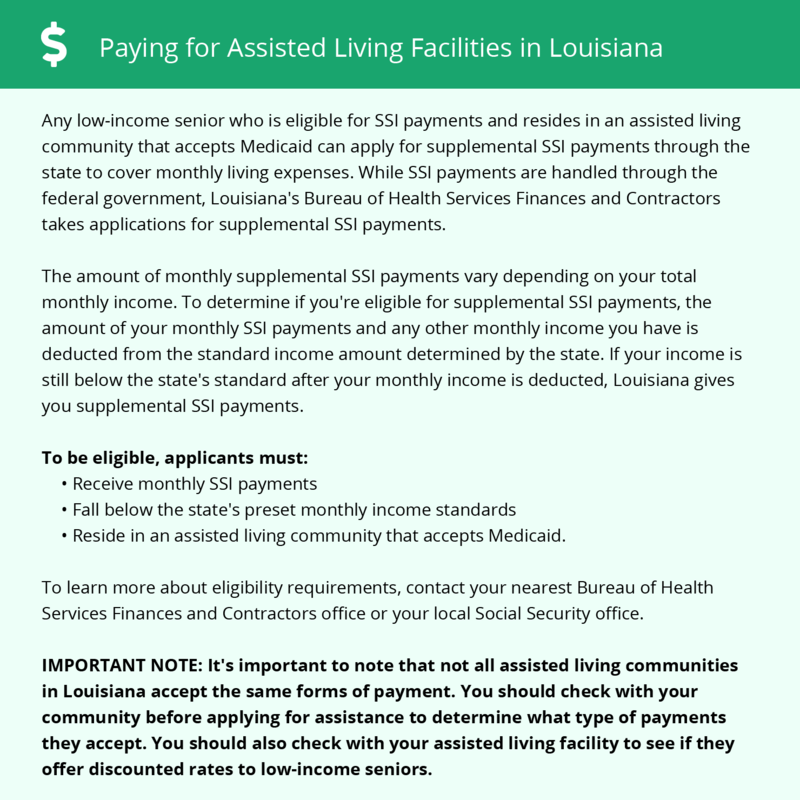 Louisiana supplements SSI payments for seniors to help pay for the costs of assisted living. The program is run by the Louisiana Bureau of Health Services Finances and Contractors office. You can apply through your local office or through your nearest Social Security office. To see a list of free assisted living resources in New Orleans, please visit our Assisted Living in Louisiana page. New Orleans-area assisted living communities must adhere to the comprehensive set of state laws and regulations that all assisted living communities in Louisiana are required to follow. Visit our Assisted Living in Louisiana page for more information about these laws.